What do you do when one person of the family prefers freshly baked breads only for breakfast? Getting dressed and run to the bakery shop first thing every morning? No. Not me. Not during my summer vacation. 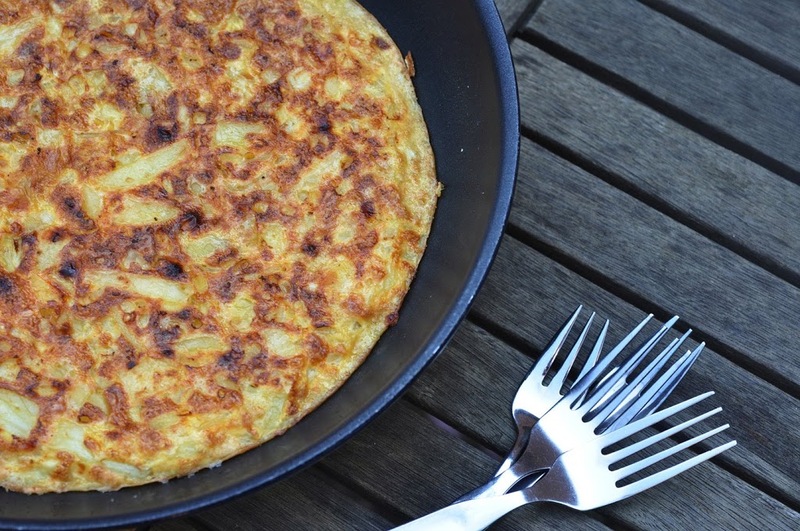 I just throw a few long lasting ingredients into a pan, and surprise that person with a hearty Spanish Tortilla. Well, that wouldn’t be at 7am, if anyone was wondering (rather 11am, for those who need to know). During our summer vacation I rediscovered Spanish tortillas as the perfect brunch or late breakfast. It’s made from ingredients that you definitely have in your house: eggs, potatoes, onions. That’s all. It’s easy to make, it’s filling, it makes everyone happy. One of those old simple and easy recipes that you tend to forget with all these superfoods and super cooking techniques around. It reminds me of a quote that I read recently about increasing obesity figures around the world: If people cooked and ate like they did 50 or 100 years ago, there would be much less fat people or people suffering from diet-related diseases. These tortillas will surely not make you fat or sick.